Whole Cones vs Turkish Espresso Pellets: Where’s That Sweet Spot? How does a brewer get the most hop oil for the buck? Does he dry hop with whole cones? Or with pellets? The research shows that a brewer using pellets can extract about 30-35% more alpha acid in solution than he can from whole cones, but I’m not aware of any oil extraction studies pitting cones vs pellets. It’s not a perfect analogy, but assuming the same holds true with respect to oil extraction – that a pellet offers up more oil for extraction than a cone, what is the optimal design of the pellet? In short, where’s the sweet spot? On one end, we have a properly harvested, dried, baled and stored whole cone flower. On the other, we have that same flower pulverized into a fine Turkish espresso powder compressed to a 3 mm pellet. How do we open up the flower to best utilize the oil inside the resin glands without unduly exposing them to the ravages of oxygen and heat? And why do we need to “open” them up at all? The answer to that last question is intuitive. Look at a whole cone. The oil together with the resins is inside the tiny cup- shaped yellowish resin glands. The glands themselves are coated with a permeable membrane, or skin. Even though it seems logical, there’s no definitive research proving that heat or air have an impact on the gland’s permeability. 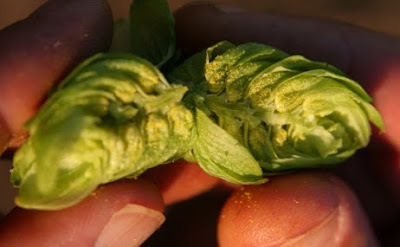 The permeability varies between hop varieties. The inside of the gland consists of many molecules, including the hop resins, the oil (about 250 bio-chemically distinct compounds) and anti-oxidants (like quercetin and xanthohumol), which themselves help prevent oxidation and prolong the shelf life of both the oil and the resin. Nature designed the cone to protect those precious glands from predators. They’re tucked around the vertebrae of the cone (the strig) where they cling to the bracteoles, the internal scales shielded by the weather-exposed bracts. If you poured water over the cone, it’s not likely that much would penetrate the bracteoles and reach the resin glands (like water off a duck’s back). If you dipped the cone into an aqueous solution, more water would reach the central axis, but the process of extracting the oils from the glands is not very efficient. This became clear to me when I recently scooped up a handful of spent whole cones that had been dry hopped. I opened a few up and I could plainly see a few yellowish glands, all perky an d plump. It’s not a great analogy, but think about coffee beans. You can’t dip coffee beans into hot water and efficiently extract any appreciable amount of oil. To bring out the oil, you need to grind the bean up. The question is, to get the best flavor and aroma out of that bean, how do you preserve the bean, when do you grind it up, and how finely do you grind it? I’ve been applying these same questions to the hop cone. It’s clear to me after examining several pellets from different pellet mills that the size of the pellet and the coarseness/fineness of the grind dramatically influence both the quality and quantity of utilizable oil. Granted, I haven’t measured the “extraction” rate or amount in a laboratory. But it’s fairly well known that hop oils degrade rapidly when they’re exposed to heat, light and air. If the key to optimal oil extraction is maximal lupulin gland preservation, but the oil glands are tucked inside, how does one “process” the cone, or open it up, and shake out the glands, without unduly rupturing, cooking, or shattering them? I called the People’ Hopmeister , Dr. Al Haunold, for help. It turns out there is a middle ground, but I’ m not sure how sweet it is. Dr. Al tells me that there was a technique developed years ago for shaking the lupulin glands out of the cone and capturing them fairly whole: pure, concentrated glands containing resins and oils. The shake-out process requires freezing the dried cones followed by a “gentle” shaking. The cones are not compressed into a bale. The process is laborious and both time and space consuming. The shake-down-and-out method might work in a Willy Wonka-ish factory run by oompa loompahs who never complain. But, after investing a few million in a pellet mill, not sure I’m ready to throw down for a massive shake down operation. Nor do I think there’s an immediate demand for pure unfractionated hop oil, as brewers are accustomed to using pellets and cones, and few have drilled down to knowing precisely which of the several dozen popular oil “essences” they want for each brew style. A badly harvested, picked and dried cone can lose up to 40% of its lupulin glands. Where do they go? They fall on the floor. Per Al, you can separate the good farmers from the mediocre or worse by the concentration of yellow lupulin glands on the picking and drying floors – the so-called “Yellow Floor” syndrome. 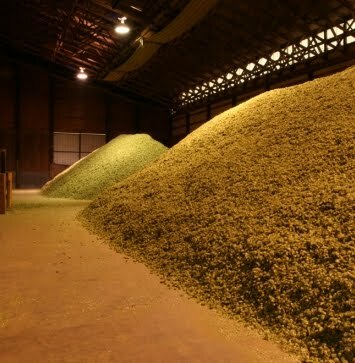 And by the way, according to the Hop Oracle, it’s not unusual for the farmer to scoop up all that yellow gold and sell it separately to extractors in years of hop shortages. In good hop production years, there may n ot be much of a demand for such sweepings. All that piney, citrusy, mango-ish, floral oil, together with all the bittersweet alpha, swept away like dust in the wind. A tragedy! So, where do we go from here? We continue to question and tinker. I recently met with a brewer who said he wanted to experiment with dry hopping using both pellets and whole cones. He’s convinced that while traditional, and perhaps even romantic, dry hopping with whole cones leaves a lot of juice on the table (in addition to soaking up a lot of valuable beer). He wants to dry hopping using cones, in one batch, hand, and coarsely ground and fatter IH pellets, in another, and evaluate the differences. Straight up he says whats driving his curiosity is a blend of both wanting to up the quality of his brew and save money by using fewer hops but extracting more flavorful oil. We like that. Question everything. In the meantime, we control the things we can. For example, we will freeze our freshly harvested 2010 bales on receipt. We’ll hammer the flowers minimally and squeeze them through our die lovingly at under 110 Degrees F. And we’ll double nitrogen flush our cool pellets, wrap them in an impermeable layer of foil, and whisk them right back into the deep freeze in under 70 minutes. Can’t wait to crank it up! Eugene, OR. Against the backdrop of the Ninkasi brewery in the midst of a major upgrade, Senator Ron Wyden (D-OR) made the case today that passing a federal bill that will slash taxes for small brewers will help crafties plow their savings back into creating more jobs. “In a state that’s hurting, “ said Senator Wyden, “ the craft brewing industry is a magnet for investment and new jobs.” Flanked by brewers, hop and barley growers, OSU researchers and equipment manufacturers, Senator Wyden proudly noted that craft brewing is “one of Oregon’s core industries,” adding $2.33 billion to the state’s economy. “A lower tax will open the door for new breweries to start up – breweries that will buy more hops and barley, build more breweries and hire more people,” said Sen. Wyden. Along with Sen. John Kerry, Sen Wyden has proposed a bill that will lower taxes on the first 60,000 barrels, which he said would provide the nation’s 1500 small brewers with an additional $44 million to invest in facilities and create jobs. 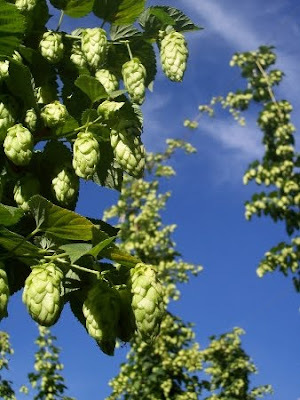 Indie Hops was pleased to be invited to speak as Oregon’s first home-grown hops merchant. My partner Jim Solberg , clad for the first time in recent memory in a pair of sensible black wingtip knock-offs (instead of his signature Berkenshire knock-offs), spoke of Indie Hops’ commitment to jobs. Earlier, Gayle Goschie of Goschie Farms, one of the heritage hop farmers with whom IH contracts, spoke of a decrease in acreage from over 6,100 acres in 2009 to around 5,100 acres in 2010, largely because the decision by Anheuser/InBev to cut its purchase of Willamette hops. “We’d like to make up for that deficit, and then some, by expanding our craft brewer customer base, putting in more hop acreage, funding more research and expanding our payroll and facilities, “ said Jim. Oregon is the nation’s second largest producer of craft beer, behind our neighbor California, which of course has about 10 times the population. Oregon ‘s 78 breweries employ 4,700 full and part-time employees in 106 brewing facilities in 47 cities. Cool numbers. Special thanks to Jamie Floyd, owner of Ninkasi, who hosted the press conference. Ninkasi’s phenomenal growth in a few short years in a local market stacked with craft cognoscenti sends a strong message that the consumer base is expanding commensurate with the escalating quality of craft beer nationwide. We haven’t even scratched the surface! Oregonians are going nuts for craft. Eugene, with a population of about 150,000, sports six (6) craft breweries. Bend, where I live part time, with a much smaller population of around 80,000, boasts a whopping eight breweries. And we’re not done. The rumor is two, maybe three more breweries, are slated to join the fun in Bend’s (much ballyhooed but far from omnipresent) sun.